Dartford may be sailing into unchartered waters as they prepare for a maiden campaign in Blue Square Bet Premier, but for defender Adam Green, this is more familiar territory. Green played in non-league's top division for Grays Athletic, Woking and Hayes & Yeading before taking what some perceived to be a downward step when he signed with the Darts in July 2011. However, semi-professional football has offered the 28-year-old another chance to rub shoulders with the big boys of the Conference, following Dartford's promotion via the Blue Square Bet South play-offs. Green's contribution to the historic season included seven goals and he was one of nine players to accept manager Tony Burman's offer of a new contract at Princes Park. You're a relative newcomer to Twitter. What took you so long and what / who persuaded you to get involved? A lot of the boys at Dartford are on Twitter. Hayzie [Ryan Hayes] doesn't take 'no' for an answer, so I buckled! I've not been on it long, but it's a good way to catch up with people. Whose results do you look out for on a Saturday evening? To be honest, I look through all the leagues to see how my mates have got on and to see if they have scored. 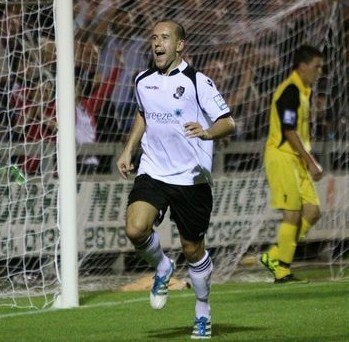 You joined Dartford a year ago and now you're back in Blue Square Bet Premier. Do you feel your decision has been vindicated? You've been in this division before. Will that help you, and what should your team-mates expect? I think my experience will definitely help me. It's a great league with so many great players and clubs. It's a big step up but the boys are ready for the challenge. What is your ultimate pre-match food? Who is the changing-room DJ at Dartford and what music gets played before kick-off? [Tom] Bonner occasionally gets a bit of stick but does a good job. He even brings his own Bose speakers in! The largest chunk of your career - to date - has been spent with Hayes & Yeading. Were you sad to see them get relegated? I really enjoyed my time at Hayes. It's a very friendly club with great staff and loyal fans. Was a shame to see them get relegated. What's the first thing you would change if you took over from Sepp Blatter as the president of FIFA? To make a Super League! I'm going to try not to name drop! With - Edwin van der Sar, Louis Saha, Aaron McLean, Andy Cole, Darren Pratley, Zesh Rehman, Michael Kightly. Against - Ronaldo, Rooney, Totti, Scholes, Van Nistelrooy. As you mentioned, Dartford are staying part-time. What do you do for work and how do you think the longer away trips will affect that part of your life? I'm a telecommunications engineer. I'm lucky to have a very understanding boss so it's not going to affect me at all. Of all your team-mates, past and present, who is / was the joker, hard man, most skilful and worst dressed? Joker - Hayzie and Burnsey [Lee Burns] #nightmaretogether Hard man - Jamie Hand and Adam Bygrave #loveatackle Most skilful - Louis Saha #legend Worst dressed - Bonner, sorry mate but I'm not sure about some of your jumpers! I've made a lot of friends in football and stayed in contact with many of them. Even friends I made from my youth team days. The team spirit at Dartford is something special though. What memories do you have of your time with Woking? And what about being with Fulham as a youngster? I had a great time at Woking with a great bunch of lads. A big club that deserves to be in the Conference. I was very spoilt at Fulham and I have so many great memories. In the seven years I was there, my highlight would be making my Premiership debut. Away from football, there's lots of good sport at the moment. Which of the Olympics, The Open Championship and/or the Tour de France take your fancy? The Olympics! The cycling is going straight past my house so we'll get the flags out!